Paycor today announced it received the Association of Corporate Growth (ACG) Deal Maker of the Year award. The award comes as a result of Paycor’s strategic acquisition of Newton Software, a San Francisco-based company that develops cloud-based applicant tracking technology. In today’s rapidly evolving labor market, small and medium-size businesses need a modern, effective recruiting and onboarding process to remain competitive. Paycor + Newton’s suite of tools help over 30,000 employers handle their most pressing priority: hiring the high-quality people they need to achieve their business objectives. In the ACG’s midsized business category, Paycor was recognized for consistently demonstrating and capitalizing on their growth potential over the past two years. 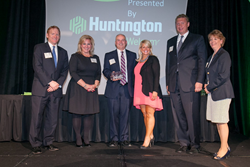 Paycor was also chosen based on their contributions to Greater Cincinnati and Northern Kentucky’s vibrant business community. Paycor is a trusted partner to more than 30,000 small and medium-sized businesses. Known for delivering modern, intuitive recruiting, HR and payroll solutions, Paycor partners with businesses to optimize the management of their most valuable asset—their people. Paycor’s personalized support and user-friendly technology ensure that key business processes, including recruiting, onboarding, reporting, timekeeping, compliance and payroll, run smoothly. Paycor’s people operations solutions are recommended by today’s most innovative brokers, bankers, and CPAs. Learn how Paycor can transform your business by starting a conversation at http://www.paycor.com.